Looks like a new fish place on the hill in Fairlawn, only problem is it’s not open. There was an article saying they were hoping to open late in August, still hoping I guess. Two parking lots up is The Hooley House. They have run quite a few commercials in the area. The lot is pretty full, we’ll give it a try. It’s pretty full of Brown’s fans, full of hope (or something like it) that Brady’s return to the field will be the omen that brings their first victory, to be enjoyed on a wealth of televisions with fine food and drink. At least the drink wouldn’t let them down. Browns and food seem on the same level. Our server was alright, what she brought just wasn’t. A couple of appetizers and a sandwich. 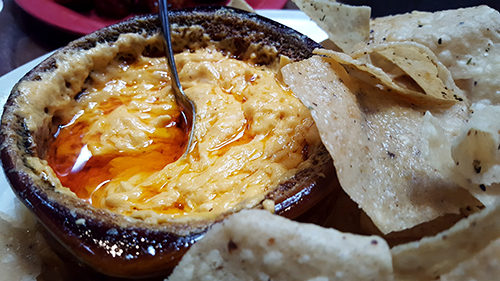 Outside of being dangerously greasy, the buffalo chicken dip had chicken and enough buffalo to make it familiar. The chips were fried to weirdly different doneness, some in fist sized clumps and haphazardly seasoned. A chip here and there with a thick crust and most with no seasoning at all. There was enough grease clinging to each chip or cluster of them, seasoning should have adhered. Still the best thing we got. They call their boneless wings Hooley Hunks. We got an order with a Kentucky bourbon sauce. They were cold, the sauce was remarkably bland and we didn’t get through more than one apiece. 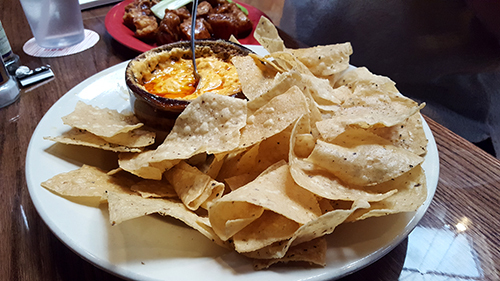 The second bite was better if you dragged it through the buffalo dip…chicken on chicken…but with a little flavor. Still better alone. 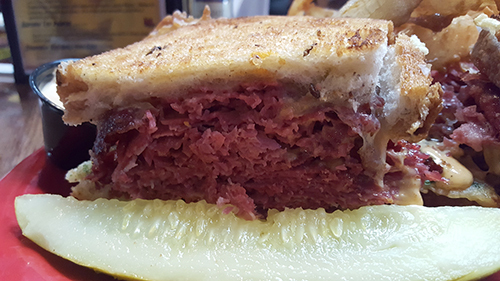 I ordered the Hooley Reuben, corned beef and Swiss cheese on rye with the addition of a boxty (Irish seasoned potato pancake) and Hooley sauce. The sauce looks and tastes like thousand island dressing with the addition of prepared horseradish, I like the boost of the horseradish but not much was going to lift the mildly corned beef, especially with a layer of potato that added a different texture and a hint of herbage but not much I would consider reubenesque. I think the side went straight from the fryer to the plate as the bottom slice of rye had sponged up so much grease it had lost it’s ability to be described as toasted. Not typical the interior against the sandwich filling is fine but the browned exterior was wrecked. 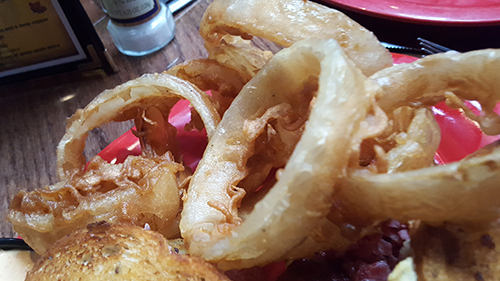 As for the side, I had upgraded to the Hooley Hoops (onion rings), which were as stone cold as the hunks (maybe the trick is to avoid anything on the menu that starts with the word Hooley) and had the same grease problem as the bottom of the sandwich and the chips. I’m pretty sure the thin Guinness based exterior was shatteringly crisp at some point, but having sat in it’s own grease and cooled, it had soggified like the bread. 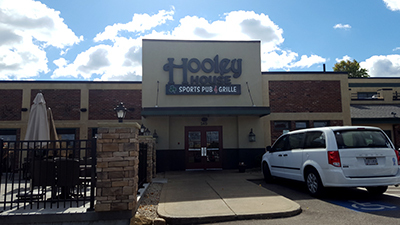 There are a lot of TV’s with a world of sports at Hooley House. If you want to track lots of games, they can help. 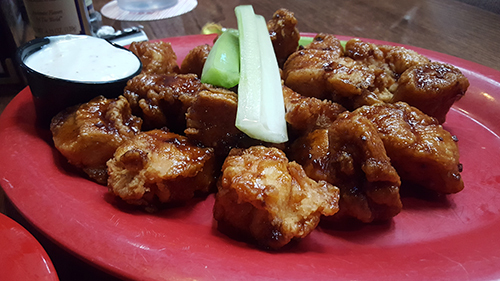 Unfortunately, there are a lot of sports bars with lots of TVs, and most of them serve much better food.